Kalomira Zangoulos began her career at an early age working with her family in Greektown. She worked collectively with Greek immigrants in the ethnically unique restaurants and bakeries. 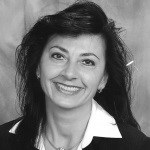 Kalomira graduated from Wayne State University with a marketing and business degree. Remaining focused on the entrepreneurial class of Grosse Pointe and Macomb County. In 2001, she went into Banking and Finance to help people that are self employeed with succession planning. Working for 14 years as a top producer at JPMorgan, Kalomira has earned the title Vice President, Private Client Advisor working with affluent clients focusing on retirement planning, investment strategies, and estate planning. She holds a series 6, 7, 63, 66, Life, Health and Variable licenses. Kalomira enjoys spending time with her family and traveling when she can.